Mesa FR Range Wall Recessed 30lt Per Hour Cold Water "Click Here For More Information"
The Price Online Includes GST, Pease request a Shipping Quote. 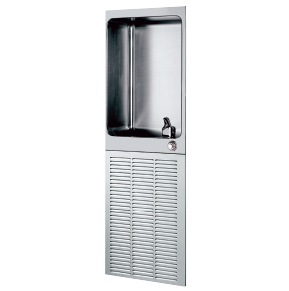 The Mesa Series FR Range is a wall-recessed water fountain with a single refigerated drinking fountain. The Mesa FR is perfect for locations where space is limited. Thanks to its high efficency cooling system the Mesa FR is able to cool either 30 or 60lts of water. The Mesa Range has a brushed stainless steel finish which ensures easy cleaning. The Mesa FR has an optional cup dispenser and filler along with a small waste bin for used cups.